Thanks to an anonymous visitor I got a tip as to where the great animated short Rockfish, which I previously posted about was from. 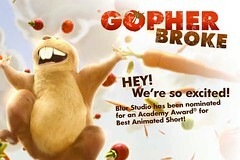 Quite a timely tip in fact, because I discovered Blur, the motion graphics studio that made it, is up for an Acadmey award for another short this year called Gopher Broke. They don't have the whole thing online, but they have a nice little trailer. Enjoy. There's also a nice high-res version of the entire Rockfish animated short if you'd like to watch it. Warning it's big. 58.6mb big. Both videos are from the following site as well as two other shorts. These guys are great animators and if you get a chance you should check out there animation and motion graphics reels on their main site. I'd be blogging them too, but I don't want to induce a bandwidth hernia.